Peter Schneider was born in Hohen-Sülzen, Germany on 22-09-1839 to Peter Schneider, Linenweaver aged 39 and Christina nee Lott, aged 29. They lived in a very small house in Hohen-Sülzen (house number 50) and Hohen-Sülzen historian Klaus Nasterlack cannot understand how Peter senior could do his weaving in the house and thinks their family must have been very poor indeed. 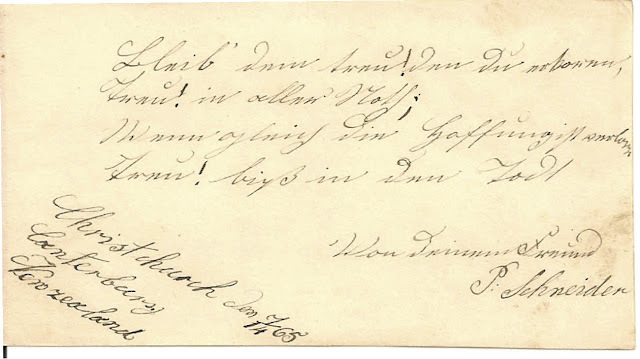 In the Hohen-Sülzen protestant churchbook it is written that Karl Meng, Georg (actually Franz) Schmitt and Peter Schneider left for Australia in the year 1863. Peter Schneider and Karl Meng were friends and most likely not related. The name Schneider is also in Karl Meng’s family but this is a very common name in Germany. Also Peter Schneider senior was not born in Hohen-Sülzen, so the two men are unlikely to be related. Karl left for New Zealand on the Sebastopol arriving in May 1863. In one of the Meng letters from 1863 it is mentioned that Peter Schneider is coming to New Zealand in 3/4 of a year along with Franz Schmitt. Peter was learning English, obviously to get ready for life in New Zealand. Peter asked Karl in the letter about a tailor’s job in New Zealand. It seems that if he had a job lined up his parents would pay for his trip out. From the Meng letter of 1864 there is more about Peter Schneider. On 03-09-1864, Jakob Keil, Franz Schmitt and Peter Schneider were studying the English letters (we are not sure if this means just studying the language or learning if from actual English letters (they probably didn't have books)). In 1813, the German states fought and won against Napoleon Bonaparte in Leipzig and threw then the French out of the German states. Peter and Franz both spoke at the 50 year commemoration celebrations for winning this battle on 18-10-1863 in the village of Hohen-Sülzen and were excellent speakers. On 25-03-1864 Peter left for London to find out about travelling to Karl Meng in New Zealand. In the Meng letters, a man named Franz Schmid died in 1865 and this may have been Franz Schmitt, just spelt incorrectly. Franz had obviously left the village for his destination. We don’t know if he got there or not, but he didn’t come to New Zealand as there is no death record for him here that we can find. The Schmid or Schmitt family were more concerned about the possessions he took with him than his death, which shows the poverty at that time. We don’t know what ship Peter took to New Zealand, but he did arrive here and set himself up as a tailor in Christchurch and was, we think, quite successful. Peter was a witness on the marriage of his friend Karl Meng to Elise Katharina Ellenberger on 05-07-1866 at St Peter's Riccarton, Christchurch, New Zealand. Charles died in Auckland and Fanny in Timaru, John probably in Auckland also. The the rest of the family died around the area of Christchurch. The church that Peter and Elizabeth married in is very interesting. The foundation stone was laid on St. John the Baptist's Day (24 June) 1864 and the stone-built church was consecrated on St. John the Evangelist's Day (27 Dec.) 1865. The Order of Freemasons took a considerable part in the building and was well represented at the opening. The church was designed by Benjamin Woolfield Mountfort (1825-1898) and Maxwell Bury (1825-1912). The Canterbury Association had planned that four churches should be built within Christchurch's 'Belts'. St. Michael's was built in 1851, St. Luke's in 1859 and St. John's in 1864. The fourth church, planned for Cranmer Square, was never built. In 1871 the Meng family sent their letter for Karl Meng to Peter Schneider as Karl had moved from Tuahiwi to Ohoka and not told them. It sounds like they heard through Kindenheim, a neighbouring village to Hohen-Sülzen. There were many Kindenheimers who travelled to Christchurch, New Zealand and letters would have been received in the neighbouring village. Peter Schneider was first a tailor in Lichfield Street, between Colombo and Manchester Street, next to the Oddfellows Lodge. While living at Lichfield Street, on 12-06-1878 he advertised in The Star for someone to move two cottages for him! He then moved to 164 Durham Street which is now the site of the South City shopping mall, so his house and premises don’t exist anymore. He must have had a bit of land as he had an apple, plum, pear, peach and cherry tree and also grew outdoor grapes which he exhibited at the Canterbury Horticultural Society shows. He received prizes for fruit many years running between 1886 to 1894, especially for his cherries and grapes. It was even mentioned in The Star on 04-03-1887 that he exhibited a Hamburg grape growing in a kerosene tin bearing six big bunches of grapes. On 10-09-1895 he exhibited New Zealand wine at an Industrial Exhibition held in Christchurch. On 29-08-1879 it was written in The Star that Peter Schneider along with Heinrich Kissel (another friend of Karl Meng) and another man were granted naturalisation certificates the day before (28-08-1879). On 21-03-1883 Peter Schneider was named as chairman of the German Concordia Society in Christchurch. While living in his Durham Street house on 27-06-1884 Peter advertised in The Star for a boarder to live in a comfortable home with a piano. It sounds as if he was very well set up. On 19-08-1885 Peter's friend and fellow Hohen-Sülzen emigrant, Karl Meng died. Peter and Heinrich Kissel were executors of his will. We are not sure quite what happened but it took a long time to sort out the will and Peter and Heinrich received 1885 pounds for administration which was a large cut of the will. We definitely don't think they cheated Karl's family, but are not sure of the difficult circumstances around the will. We do know that Sarah Winfield Meng, Karl Meng's widow and second wife, went overseas after Karl's death and Peter Schneider took one of the daughters in and looked after them for several months, making sure music lessons were continued. Heinrich Kissel took the other two girls. Peter was paid maintenance from the will, which could explain why their were so many expenses from the will. Peter’s children went to Christchurch West primary school and were listed in the paper as winning many prizes, especially his daughter Fanny and son George. Peter’s son George and his daughter Fanny completed degrees at Canterbury College (now known as University of Canterbury) and Fanny completed a BA in 1899. George took a while to complete his degree as he was working as a school teacher as well. He completed a BA in 1909. Peter Schneider died on 24-05-1920 at his home at 164 Durham Street, Christchurch aged 80. It was only a few months after his death that the whole family changed their last name to Raymond. I guess that Peter’s son George chose the name after his son George Raymond Schneider who died at age 13. The whole family changed their names to Raymond, probably because of the stigma a German name had after WWI. George Schneider was a respected teacher and maybe he wanted to keep a respectable front in his job. On 17-12-1919 George Schneider was working as Headmaster at Allenton School, Ashburton and by 9-10-1920 he had resigned as Headmaster and been appointed as Inspector of Schools under the name George Raymond. He died on 20-10-1944 and is buried in Waimairi Cemetery, Christchurch. The following is the advertisement that the family placed in the Press on 5 October 1920, to let people know of the name change. Charles Arthur Schneider put a separate advertisement in the newpaper in Auckland where he lived and worked as an engineer. Click HERE to read it. He changed his name a few weeks after his siblings. I have yet to find a living descendant of the Schneider/Raymond family. If you are a descendant please get in contact with me. I have a large photo collection and possibly have photos of the Schneider/Raymond family in my possession which may be of interest to the family.